You find your rain gutters filled with leaves and old nests after you come back from vacations. Are you looking for a professional service to clean them out? San Antonio Rain Gutter Pros is the answer. Our professionals are experienced in cleaning out various types of rain gutters. Why Hire the San Antonio Rain Gutter Pros? Rain gutters need to be cleaned on a regular basis in order to prevent downspouts from clogging or keep algae from growing. Regular rain gutter cleanings do more than ensure that your rain gutters work as they should; they prolong the life of your investment. They must be inspected and clean every year to make sure that they drain properly. A clogged rain gutter prevents rainwater from flowing down the downspout. This will cause the gutter to overflow onto the foundation of your home. 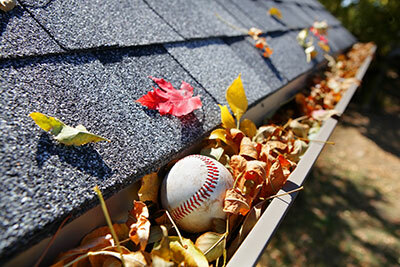 If you have just invested in some expensive landscaping, it is time to clean those gutters out. Safety First Do ladders give you the creeps? You don’t have to risk it just to clean your gutters or downspouts. Accidents are bound to happen if you aren’t used to standing on ladders for long. Gutter cleaning isn’t a quick job either. The professional cleaners from San Antonio Gutter will clean them out so you don’t have to. We have experience working on ladders and use proper safety gear to prevent accidents on the job. Can we guarantee a job well done? Absolutely! If you aren’t satisfied with our service, we won’t be either. All of our services come with warranties and gutter cleanings are no different. A fully functional rain gutter and downspout system prevents water from seeping through the doors and windows of your home or commercial building. The experts at San Antonio Rain Gutter Pros will clean out everything from leaves, dirt and sticks to leftover roofing material. No one knows your requirements more than you do. We keep initial consultations free for your convenience. We will inspect your investment before coming up with estimates. San Antonio Rain Gutter Pros offers a highly personalized service. Are you running your home or commercial property on a tight budget? Our service fits your funds. We have a range of gutter cleaning services on offer from algae cleanups to bracket replacement. All of our services are insured and our staff is licensed. Did the last cleanup job take you the whole day to complete? Our pros take less than half the time it takes you to rid your investment of debris, clogs, mold or algae. Our aim is to make the process as quick and convenient for you as possible. Make an appointment for a scheduled rain gutter cleaning with us at 210-714-1500. One of our professionals will schedule a free consultation at a time that is convenient for you. © COPYRIGHT San Antonio Rain Gutter Pros.